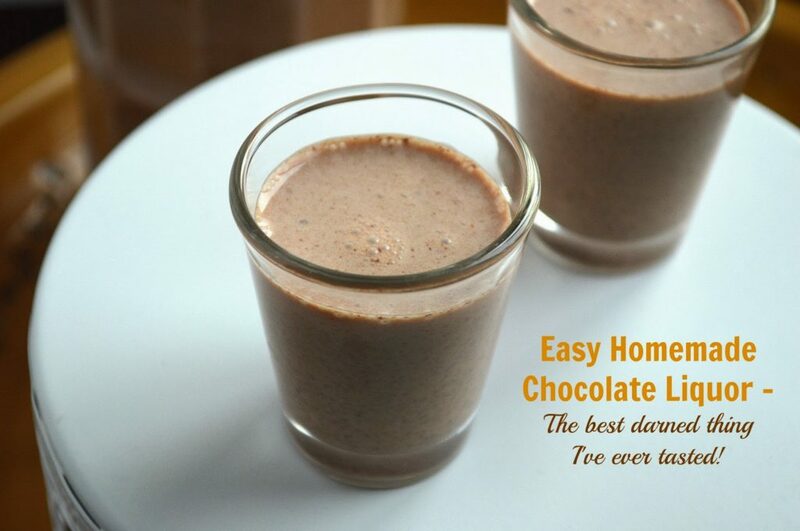 Hold on to your seats – THIS is seriously just about the best thing I ever tasted! Last weekend we decided spur-of-the-moment to go to dinner with friends. 4 adults and 4 kids. We headed to the only BYOB in town which happens to be an Italian restaurant that recently changes hands, literally 4 minutes from our respective houses. Our dinner was fabulous! I had the shrimp & crab risotto, my girlfriend had duck, our husbands both had steak…one with crab and one over pasta. We started out with lightly fried calamari, artichoke bottoms stuffed with crab and an Antipasto Platter. All were delicious! Soooo, you know how my favorite thing to do is recreate recipes that I tasted out (or somewhere) right? Well, I will be recreating those artichokes…soon…really soon! What stole the show completely that night for the four of us was not the food. Instead it was what happened after dinner was over. The owner who is as Italian as you can possible be, came by to see how we enjoyed our meal…in each hand was a gallon sized Everclear bottle – as in grain alcohol. One was his homemade Limoncello, the other his homemade Chocolate…something. Our friends who had been there recently immediately pointed to the chocolate one – me, I was going to say Limoncello…but in a flash he poured 4 shot glasses of the chocolate. I was skeptical, but “took one for the team” and joined in. Then everything stopped…everything. What had just danced over my tongue and slid down my throat was literally the best thing I ever tasted. I think I heard angels singing. The four of us connected eyes and collectively moaned! Bless that sweet man for immediately pouring us another round! When I recovered from what I can only refer to as my moments of pure bliss, I practically jumped out of my chair to ask him “WHAT WAS THAT?? ?…what was it”???? He replied – “Ooooh, itsa grain al-co-hol witha da melted chocolatea anda da creama.” I keepa it inna da freezer for an hour beforea I-a bring it to you”. It just so happened that I hadn’t cooked in days due to a power outage that whacked our area after a big ice storm (which is why I had to go out for a really good meal). BUT the next day I immediately attempted to replicate what was in that bottle. We had a Confirmation party to attend that day so I brought a big bottle of it with me to test it out. We arrived late to the party due to other commitments and I think by the time we got there there were only about a dozen adults – My Homemade Chocolate Liquor went SO fast it was crazy. The women had twice as much as the men we kinda hid it from them) it was SO good!! Our friends Nick & Nicole, who we went out to dinner with, were there too and they were ecstatic that I had made & brought it. The Chocolate Liquor received two thumbs up from both of them! This would make a fabulous gift for someone you love – especially for someone you love who loves chocolate. It might even make someone you want to love you….love you! Food can do that, lol!! I scrapped my plans to ship a baked treat to my friend Shaina from Take A Bite Out Of Boca who I was paired up with this month for The Leftovers Club (a fun club where each month we are paired up with another blogger and mail the other a fun treat…wanna join in??) and decided to ship her a bottle of this Homemade Chocolate Liquor instead. I froze it, packed it in a small cooler with ice pouches, stood in line at the post office, twice (their power was limited from the storm, the office was a disaster and super crowded…I had to get a priority box from the counter since there were none out in the lobby). I was next in line when a lady needed help with something…no one moved but me. The guy behind the counter loudly proclaimed “see there still are really nice people in the world”. I then stepped up for my turn, thought I’d save time by proclaiming “liquid, fragile and perishable” before he asked – he then said “what is it” I happily replied “Chocolate Liquor” he yells “NOPE”! and pushes it away – “Can’t mail that, its flammable”. I was like oh, no it can’t catch on fire…he was like “NOPE”! And off I went. I considered for a second driving to the next towns post office and NOT saying that it was a liquor but then had visions of being carted away to a dark cell that had no oven, stove or pantry -SO Shaina is getting these cookies instead – they are good and all – actually they are my familys favorite cookie…but they are not the magical elixir of chocolate that was in the bottle. Shaina sent me these Chocolate Avocado Muffins which were so moist and delicious…I have never had a dessert with avocado in it before AND I would never have guessed that they had avocado, coconut oil and agave nectar in them instead of the usual suspects in a muffin! I adore avocados, but that was something I just couldn’t wrap my brain around – well…consider my brain wrapped because these were delicious! Check out Shaina’s site for other recipes you might enjoy – especially if you are looking for recipes with a healthy twist – she’s got one for you like these Cucumber Feta Rolls or these Roasted Chick Peas! YOU HAVE TO MAKE THIS – You have to! It doesn’t really even taste like alcohol – its like a dessert. It was SO simple too! You can add a bit more garin if you want to taste the alcohol (I do want to taste it a bit – at the restaurant, I couldn’t). If you make this when you make this, you HAVE to let me know what you think! Break your chocolate up into bite sized pieces. In a large saucepan or pot combine chocolate pieces and cream, over medium heat stir mixture until chocolate is melted and smooth – like hot chocolate. Add in the sugar and stir until dissolved and smooth. Add in water and vanilla and stir until combined. Remove from heat allow it to cool for about 15 minutes, add in your grain, stir well and pour it into whatever you choose to store it in (mason jars, decorative bottles, an old alcohol bottle, etc). Place it in your fridge for up to 2 weeks (but I don’t think it will last that long). Colleen’s Notes: If you know you are going to serve this – place it in the freeze for an hour or so just before – yummmm! You can even freeze it completely (just give you storage jar head-space) then that it out just before serving Mmmm-Mmmm-M! If you don’t want the chocolate bits that are in it (as you can see in my empty shot glass) strain it before you bottle it. I however think the bits make it amazing!! 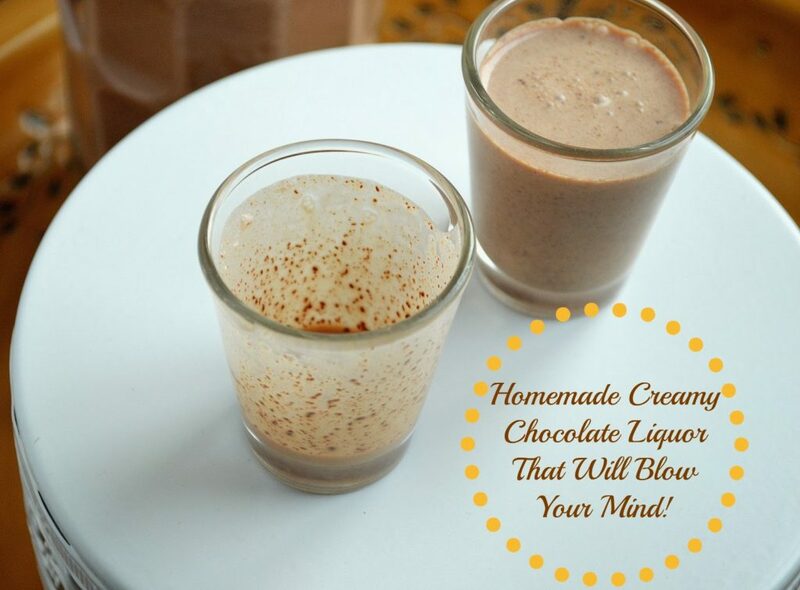 You can totally serve this as a Chocolate Martini too…just sayin’! Need this in my life ASAP!!! Ooooooooohhhhhh my god I really wish that postman had let you send me this because I am now craving it like mad! It sounds fantastic. And since I don't have a Valentine, I would have happily drank this all by myself tomorrow night and been a very happy camper. Oh well…I'm happy to get your perfect cookies too 🙂 Thanks for trying!!!! Wow! How nice of you to go out of your way to ship this. It looks amazing!! This looks terrific. You know I WILL be making this one. YUM. Marissa, I TRIED to mail it – but they wouldn't let me 🙁 Now I'll just have to drink it all! OMG…FIrst the hot apple pie moonshine and now this…..I think I have a case of the vapors ! …I'd now like to blog/post about both of these recipes in my blog with proper links and credits with permission of course. I sent the Apple pie recipe to my best friend in Washington state who introduced me to thisapple pie concoction last year ..now I know I will always have some waiting for me. YUM!!! The trials you went to for shipping this – oh man! We always do homemade limoncello shots for Christmas with our huge family. This is on the list for DIY Christmas gifts for 2014! Made this last night. We drank the dregs just after and the bits of chocolate melting on my tongue after swallowing the liquid were delicious. Then later we drank a bit of the primo stuff when it completely cooled and Oh My God (omg wouldn’t suffice) AMAZINGLY! I will definitely make this again. My husband is sure I am a kitchen goddess. So I just came across this and decided I wanted to try it. I got everything together and started the process. While adding the cream I spotted my immersion blender. Hmmm….I thought…..if I use the blender maybe I won’t have to worry about straining it or having bits of chocolate stuck left in the glass. So that’s what I tried. Put it off to being tired but I didn’t even think about what would happen when I whipped up that concoction. I bet you can guess what happened, I got whipped chocolate liquor. It is actually better than I expected! I do regret not putting it all into canning jars, but I’ll figure out how to get it out of the bottle with the tiny mouth.